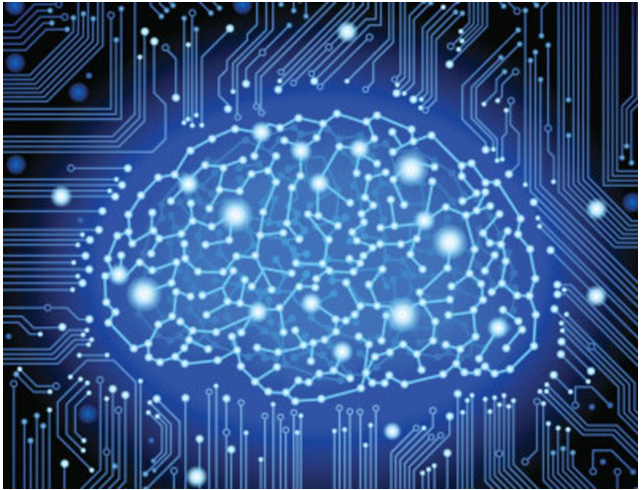 In an ongoing effort to move ‘narrow, application-specific’ AI to a new level of Artificial General Intelligence (AGI), machine-learning experts are teaming up with neuroscience researchers, creating the stage for a new scenario of corporate disruption. While current machine-learning efforts are mainly focused on extracting knowledge from ‘big-data’, applying sophisticated algorithms to specific applications like language translation, image recognition or customer profiling, the next stage of AGI will provide systems with learning and decision making capabilities equivalent to those of a human. Neurons represent decision points where process-related decisions are made to guide und supervise the performance in respect to the organizational objectives. Synapses describe the connections and network between the neurons and the flow of information between different organizational units. Short-term and long-term memories are provided to store all information that is generated by corporate activities incl. external events that impact the organization. Collection of ‘sensory’ information from external and internal events stored in memory for further processing. Continuous communication between the neurons to spot opportunities and deviations from corporate goals to initiate decision making. Continuous learning to provide knowledge about market trends and recommendations for business model adaptation. Taking the thought model of a BiO a step further, it is a logical to view it as an institution with its own mind. While blood is the source of humans’ energy and live support, a BiO is driven by data flowing through the entire organization. The mind of a BiO is represented by its leaders. Decision are governed by the statues and governance of the organization as well as the legal and ethical frameworks defined by governments, taking into account our socio-economic as well as democratic value base. Decision-making is one of the fundamental tasks of any organization. Thanks to its continuous, unlimited learning capacity for knowledge generation applying AI technology, a BiO is far more capable to adapt to change compared to a conventional organization. Having successfully mastered digital transformation, business leaders of BiO’s have the opportunity to take a fresh look at the corporate structure and performance levels with an unprecedented opportunity to digitally reinvent parts of the company and to pursue new profitable business avenues. To succeed in this disruptive environment, organizations will need to offer compelling new experiences, establish new focus, build new expertise and devise new ways of working. Business leaders will face a stark choice: Either digitally reinvent their enterprise, or watch as their businesses decompose around them. Successful Digital Reinvention based on a BiO concept will involve a fundamental reimagining of how an organization operates and how it engages with its environment. For traditional organizations, Digital Reinvention based on a BiO concept involves a fundamental ground-up reinvention of strategy, operations and technology. Strategically, digitally reinvented businesses maintain an overarching focus on experience rather than production. Operationally, BiO’s are committed to continuous calibration and improvement. They foster cultures of everyday innovation among individuals and across the ecosystem, and they work to seamlessly interchange the physical and the digital. Define the problem. Judgment is required to identify and define the problem. The goal should be to solve the problem not just eliminate its temporary symptoms. Identify the criteria. Most decisions deal with more than one objective. When buying a car, one may want to maximize fuel economy, minimize cost, maximize comfort, and so on. Weight the criteria. Different criteria will vary in importance. Rational decision makers will know the relative value they place on each of the criteria identified. Generate alternatives. Tradeoffs and risks need to be considered when formulating alternative actions. Rate each alternative on each criterion. How well will each of the alternative solutions achieve each of the defined criteria? Typically this requires a forecasting of future events which is possibly the hardest part of decision making. Compute the optimal decision; ideally after all of the first five steps have been completed. In a digitally transformed company Type D (delegated) decisions are likely to be automated, possibly with an exit-path for human judgement in exception situations. Within a BiO due its neuron/synapses infrastructure and continuous learning capacity, Type C (cross-cutting) decisions are automated as well. For Type A (ad-hoc) decisions as well as Type B (big bet) decisions, a BiO has the intelligence to make qualified, machine-based recommendations, leaving open the possibility to apply experienced-based intuition before execution. Define the parameters which are required to make a specific decision. These parameters will define the memory structure of the corporate brain model to provide the knowledge base for AI supported decision making. The entire model, due to its brain-like architecture represents a ‘living’ organization which can quickly adapt to change. Thanks to the application of AI across the entire organization the model can also be used to simulate the consequences of changing the business model or the consequences of expanding into new business segments. Business modelling as a strategic tool is nothing new. What’s new with a BiO concept is that the operational infrastructure is the model.